Irish playwright and novelist Brendan Behan said, "All publicity is good, except an obituary notice." After this past week, Judge Michael B. Hyman might disagree. When I noted on January 16 that Judge Hyman had 'broken the press barrier' with a nice mention in Neil Steinberg's column, I had no idea that Hyman would soon become the focal point of the Sun-Times' coverage of this judicial primary. The Sun-Times endorsed Brian Terrence Sexton, one of Hyman's three opponents, this past Sunday. 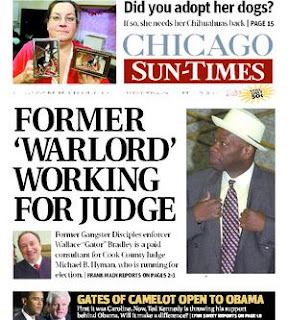 Then on Monday, January 28, Sun-Times crime reporter Frank Main wrote a story that was featured on the front page about Hyman hiring Wallace "Bradley" Gator, once a "warlord" for the Gangster Disciples street gang and later an unsuccessful candidate for alderman. According to Main's article, Bradley was hired, in Hyman's words, to "help get my message to the African-American community." The article noted that "Bradley has worked on campaigns for Rep. Jesse Jackson Jr. and Cook County Court Clerk Dorothy Brown." Sexton, currently the supervisor of the State's Attorney's gang crimes unit, criticized Hyman's hiring. Main quoted Sexton in the article: "Of all the people he could have chosen -- reverends, community leaders -- to hire someone like Gator Bradley, a self-admitted warlord for the Gangster Disciples, is a serious lapse in judgment." Judge Hyman called a press conference to respond to Main's story on Monday afternoon. "Gator" Bradley was there, as were several Hyman supporters, including retired Appellate Court Justice R. Eugene Pincham. Charlie Wojciechowski, of NBC-5, covered the press conference (video link) for the station's Monday 5:00 p.m. newscast. ABC-7 was also there. Reporter Leah Hope filed this report on the station's 4:30 p.m. newscast Monday, giving some 'face time' to John J. "Jack" Murphy and Kim R. Kardas, the other two candidates for the vacancy that Hyman and Sexton also seek. Endorse 'em: Retired Supreme Court Justice Mary Ann McMorrow gave an impromptu speech at a fund-raiser luncheon recently at Maggiano's for Judge Michael B. Hyman, whom she appointed to fill a Cook County Circuit Court vacancy. • Quoth McMorrow: "In my 40-year career, one of the things I am most proud of is being able to appoint Michael to the bench. I wish I could have appointed him straight to the appellate court." Wow. The unexpected news about Judge Michael B. Hyman hiring former gang warlord Wallace "Gator" Bradley reminded me of the time I had lunch in Los Angeles with Ed Asner, of "Lou Grant" fame, for a magazine interview. We got on famously, wine was had, and I rolled out of the restaurant thinking that I had really gotten to know the man. Then, about a week after the article hit the stands, the National Enquirer trumpeted the news that Asner had some love child with a young chippie. He didn’t tell me about that, I sulked, afterward. Guess we aren't the pals I thought we were. The same thought crossed my mind when, a week after I bumped into Hyman — of all the judges in all the world — in the lobby of the Daley Center, and wrote a piece never touching upon former gang-bangers in his employ. Who thought to ask? Of course it's possible to change your ways. I sure hope so. But Bradley's — and, by proxy, Hyman's — problem isn’t having once been part of this horrible threat to city youth. No, the sticking point is the idea that, in order to reach out to black urban voters, you need to hire a guy who knows the right gang symbols to flash. That seems a very skewed view of urban life, and one that is both surprising and unwelcome to find in a judge. That brings us to today, and Glenn Reedus' column in the Chicago Defender. Hyman understands better than most in his job that people change and some of us need help. * * * Hyman weathered the criticism of hiring Bradley like a man comfortable in his convictions. He offered no esoteric or high brow rationale for hiring him. He knew that he needed to reach Black voters and figured Bradley could help. The judge might be unaware that Bradley has been relentless in garnering support, phoning the Defender with information about the judge’s appearances, working to get him before our editorial board and providing a wealth of background. Whether the press attention hurts Hyman or helps one of his opponents won't be known until after the votes are counted on February 5. But, with all this unusual press activity, there remained one constant: The Chicago Tribune, with its continuing disdain for circuit court campaigns, printed not a word about any of this. Filling in some more of the Alliance "grid"